The TM 250FI MX is a modern-day works bike by every definition. The production run is minuscule; there were only a half dozen of them imported to the U.S. for the 2018 model year. Each one was assembled by hand in a race shop in Italy. 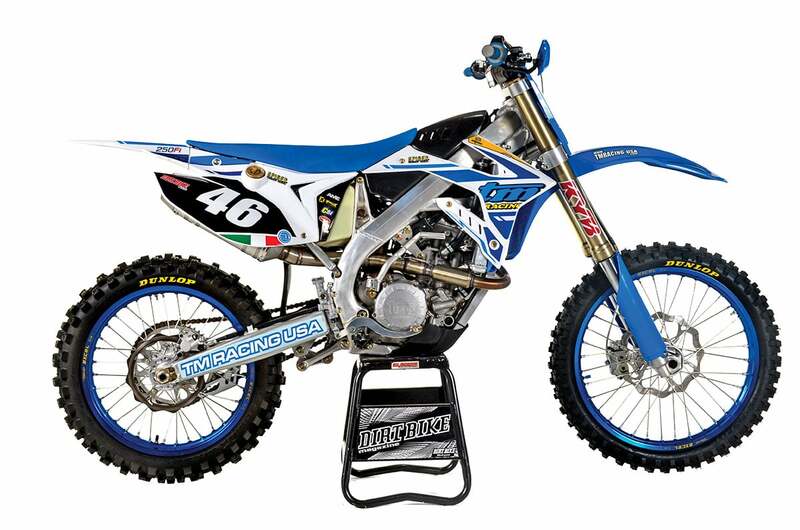 The bike was specifically built to compete in the World Championship MX2 class under factory rider Samuele Bernardini. 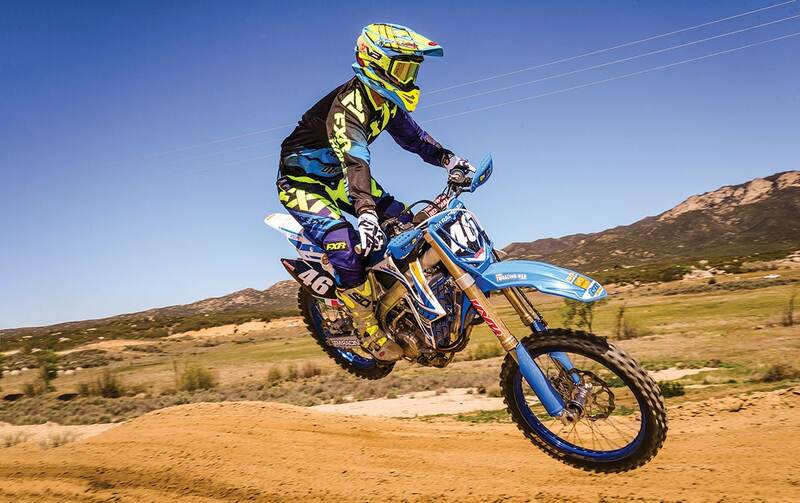 The TM is also considered illegal in AMA professional racing. The only real difference between the TM and works bikes from the David Bailey era is the fact that anyone can purchase the TM. The TM has already won a moto in the MX2 World MX championship. It’s a works bike available to the public. TM is a tiny company in Pesaro, Italy, that is fanatically devoted to racing. 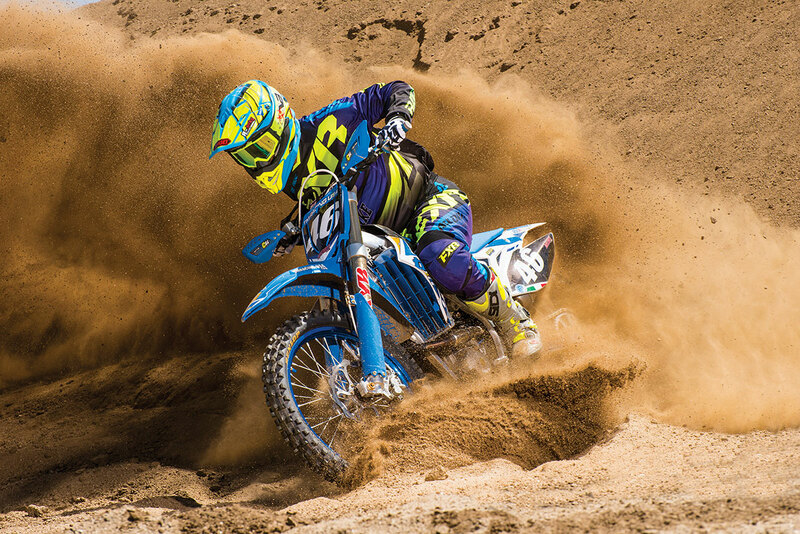 Everything revolves around FIM GP competition, both in motocross and off-road. 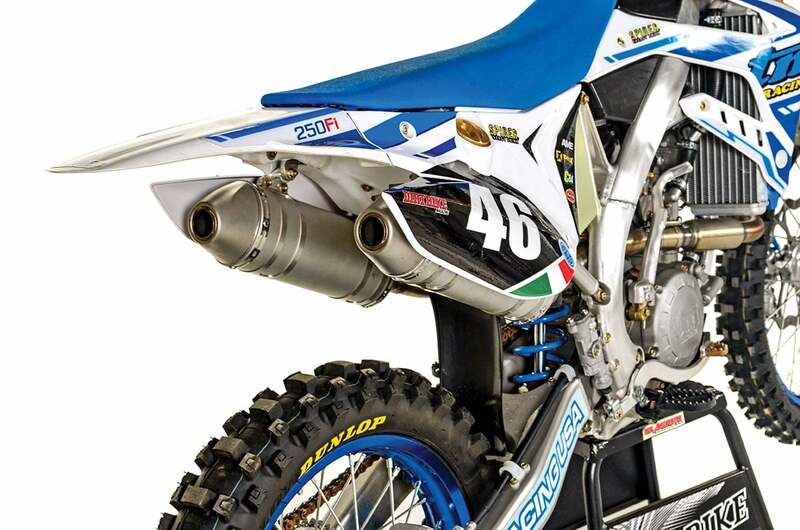 Last year the company debuted a new bike in the MX2 class for Bernardini. The main goal was to win races, but the spin-off was the development of a motorcycle to sell. The first moto win came quickly—in the horrific conditions of round two in an Indonesian monsoon. The release of a bike to sell came more slowly. The 2018 models only arrived in the U.S. a few months before a full run of the 2019 models. We got to test one of those first examples. For such an offbeat motorcycle, the TM has some very mainstream components from companies like KYB, Nissin, Brembo and Renthal. The bike has an unusual motor layout. The cam chain drives a single gear in the head, which turns the two counter-rotating overhead cams through gears. Finger-followers are used to open the four valves. The motor is positioned in the frame so that the intake comes straight down from above where the fuel tank is normally located. The gas is stored under the seat. TM has positioned the tank under the seat for a number of years on all its four-strokes. The new motor layout is designed to be lighter than the one it replaces, which is still in the TM lineup as an enduro model. The new version has two exhaust ports that feed two separate exhaust pipes—one on the left and one on the right. This bike was designed as an electric-start motorcycle, but unlike KTM, Honda and Yamaha, TM decided to leave the kickstarter in place. The bike can be started with an old-fashioned kick if there’s no life in the battery. To shave off weight, TM looked to the frame. TM is already the only Euro manufacturer that uses an aluminum perimeter frame, but every part was reconfigured to shave off ounces here and there. The components are an interesting mix. The fork is a KYB and has coil springs. The shock is made in-house by TM. The engineers actually mixed brands in the brake department. The front is a Brembo, and the rear is a Nissin. Ralf Schmitt, the U.S. importer, has a number of components that he puts on the bikes specifically for the American market, items like a lower Renthal Fatbar handlebar. In each case, though, the parts used are top-of-the-line items that you would expect on a works bike. The 2018 TM 250FI MX carried a price of $10,495, but only a few were imported to the U.S. The 2019 models will be here early and have a similar price. You don’t just get on a TM motorcycle and feel right at home from minute one. There are a number of odd distractions. The most overwhelming one is the sound. The motor’s intake is pointing straight at your face, so you hear things that you simply don’t hear on other bikes. Yamaha riders might think they deal with this type of noise, but the TM is on a whole different level. Mostly this is because the airbox cover has large vents, but the motor also has its own collection of unusual sounds. The gears that drive the cams are probably responsible for most of them. Once you get around that, it’s apparent that the bike has a ton of top-end power. It’s every bit as powerful as a KTM up high, and that’s saying something. You have to rev it, though. This isn’t the type of bike that allows you to passively cruise around the course. You scream it until you think you’ve gone too far, then go a little farther. Again, this is a little like the KTM but more extreme. The TM’s low-end power isn’t very impressive, and the motor also has a slow-revving feel, as if it has a heavy flywheel. This might be the result of a few extra gears spinning within the motor between the cam drive system and the electric start, but it’s not much of a factor unless you try to use the clutch to bring up the revs from too low. It’s more rewarding to simply downshift. The TM comes with a switch that allows you to choose between an aggressive ignition map and a milder one. Universally, test riders preferred the aggressive one, which seemed to have more power everywhere. We don’t really know what gearing the bike will have in its final configuration, but ours started off with a 14/50 combination, and we changed to a 13/49 with good results. Another item that we switched was the shifter. The original one was much too short for anyone with adult-sized feet, so Ralf broke out the welder and extended it by more than an inch. Then we got to try the bike with two different ignitions. With the first one, the motor had a tendency to occasionally flame out. The revised ignition was a big improvement, although not a perfect cure. When you deal with a company this small and such small numbers, the difference between prototype and production is very blurry. One aspect of the TM that requires virtually no adjustment is the suspension. The fork is excellent. It’s set up for larger riders and hard racing, but most riders will find the feel familiar and comfortable. It’s a KYB coil-spring fork after all, and that makes it something that virtually every rider in America has experience with. The shock, on the other hand, is definitely offbeat. TM makes it in the same factory that produces the motor. It’s fully adjustable, but accessing the clickers is difficult. It’s hard to even get a glimpse of the shock between the aluminum frame spars and the fuel tank. Luckily, the original settings worked well enough as delivered. Once we set the preload, we never messed with it, and test riders had no complaints. We have ridden a number of TMs over the years and know what to expect when it comes to overall feel and handling. This one might be all new, but it has those same characteristics. It’s a very stable bike. You pick a line and go, and it tracks very predictably and smoothly. It’s also a large bike and demands a little muscle to turn. If we had to compare it to a more mainstream motorcycle, it would be most like the Yamaha YZ250F. The TM’s hydraulic clutch has an easy pull and a good feel. Make no mistake, though, this is no Yamaha. The TM is an exotic motorcycle that few riders will ever ride or even see. The fact that it exists is surprising. The fact that it’s fast, effective and competitive is downright amazing. We don’t know how a company this small can produce a motorcycle capable of winning on the world stage and then sell it at any price. We’re just glad they can. WHATEVER HAPPENED TO IVAN RAMIREZ?